The central pith of palaeozoic coniferous trees had most often been degraded or decayed before the tree trunk had become thoroughly silicified so that trunk fragments with well preserved pith are seldom found. The aspect of petrified pith may differ conspicuously from that of the surrounding wood. This is seen in cross-section in Fossil Wood News 27 where there is no well-defined boundary between pith and wood but a transitional region instead. Likewise conspicuous is the aspect of longitudinal sections as seen here. 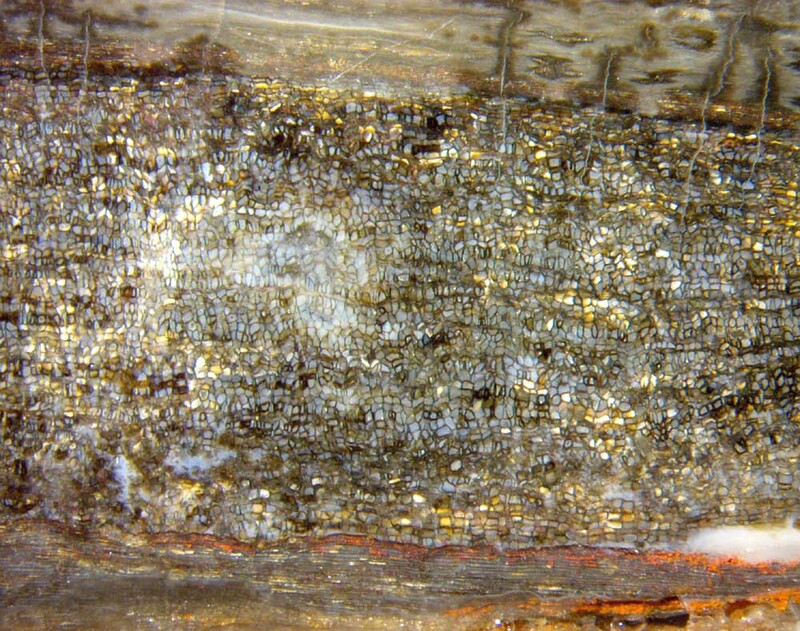 Fig.1: Central part of a silicified coniferous tree, pith between wood. Sample: W/42.1, Wilmsdorf. Image width 8mm. In this case there seems to be a definite boundary between the chaotic pith and the orderly wood with narrow tracheids. This is more clearly seen in Fig.2. with tracheids 40µm across. 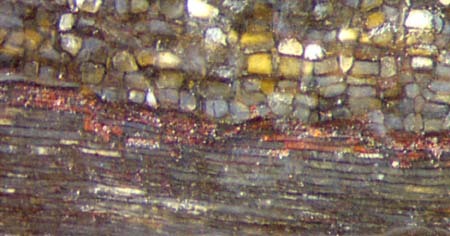 Detail of Fig.1, width 2mm. Remarkably, the combination of central pith and surrounding wood as a main characteristic of tree trunks has persisted from the gymnosperms of the Carboniferous until present. Since it is found with Angiosperm trees as well (Fig.3), one may wonder whether the usually narrow pith is a relevant structure or a mere relic of evolution. No answer is given here. 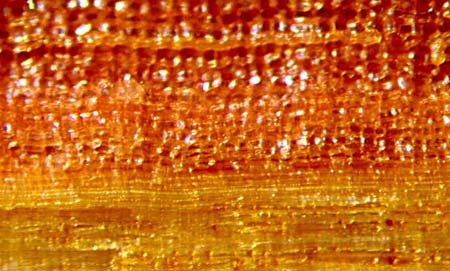 Fig.3 (left): Raw crack face of cleft Prunus stem, recent, 12 years old, pith with cell sizes of about 80µm bordering on wood with tracheids 15µm across. Same scale as Fig.2, width 2mm. The polyhedral cells of the recent pith are seen to be preferably arranged here in vertical rows in the stem (horizontal in the picture). The white spots are reflections from the glossy walls of the empty cells. Other than the cleft wood in Fig.3, the cut and polished petrified wood in Fig.1 is perfectly smooth and plane since there are no cells left hollow. The variety of cell shape and arrangement in Fig.1 is puzzling. It is a peculiar combination of randomness and chain-like order. All cells are filled with bluish or white chalzedony. A small part of the pith, below in Fig.1 and enlarged in Fig.2, shows a different pattern which suggests a stack of block-shaped cells.